There are 1,715 biographies on this site. All of the featured lives, from 1560 to the present day, had a connection to the Irish language. The contents of the site are based, principally, on the series Beathaisnéis by Diarmuid Breathnach and Máire Ní Mhurchú. Since 2013, new biographies have been drafted by a panel of joint editors under the direction of Cló Iar-Chonnacht. The information pages on this Web site are available in Irish and in English. The biographies, however, are in the Irish language only. There are over 1.3 million words in the original text, therefore it is beyond our resources to provide translation or linguistic support to visitors to the Web site. 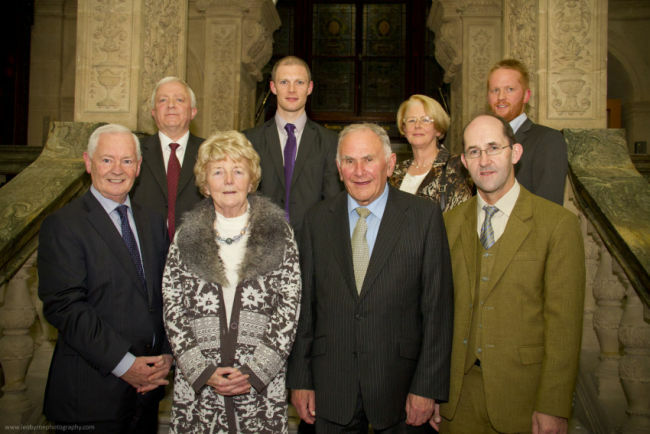 (Left to right, back): Dr Peadar Ó Flatharta, Fiontar, DCU; Dr Gearóid Ó Cleircín, Fiontar, DCU; Dr Caoilfhionn Nic Pháidín, Fiontar, DCU; Dr Brian Ó Raghallaigh, Fiontar, DCU. (Left to right, front): Dinny McGinley TD, Minister of State for the Gaeltacht; Máire Ní Mhurchú, author of Beathaisnéis; Diarmuid Breathnach, author of Beathaisnéis; Micheál Ó Conghaile, Cló Iar-Chonnacht.